Christmas decor may already be taking over your favorite stores, but we all know that Fall has just begun and there’s still plenty of time to celebrate Halloween with a spooky stenciling project. Why not paint some pillows for your porch? Or begin your search for the perfect pumpkin carving stencil? Or, better yet, stencil one of the four fun Halloween-themed table runners I’m sharing with you today! First up is this witchy table runner and coordinating decorative charger by Kim at Made in a Day. Her tutorial includes full step-by-step stenciling instructions for both projects. Each Halloween I have a theme for my decorating madness and this time the theme is Vintage Halloween and all things Witchy! Let me show you how I made this adorable table for this years haunted decor using the Cutting Edge Stencils “Witch Craft” Stencil. Brit + Co. stenciled spiders creeping across this burlap table runner with a handcut stencil, then added paint splatters to complete the effect. Spooky! Melissa Mortenson over at The Polkadot Chair used a freezer paper stencil and spray paint to make her Halloween table runner. 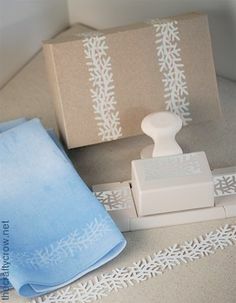 Freezer paper stencils are great when you’re working on fabric, because once you iron them on they stay in place until you peel them away. I’m so excited to be sharing this super simple Spooky table runner with you today! The runner is made from burlap and goes together very quickly! Plum + Trinket created a hauntingly beautiful tablescape for Halloween, starting with this stenciled table runner covered with spider webs. Inspired by a particular runner I came across in stores, I decided to use found materials in my home to create this spine-tingling and stenciled DIY Halloween Table Runner.